When infection is unavoidable, fruit flies ramp up recombination « Nothing in Biology Makes Sense! So, you wanna head back to my place after this and make some recombinant offspring? Imagine you find yourself in the midst of a large-scale epidemic, similar to the scenarios portrayed in movies like Contagion or Outbreak (or both!). The disease is extremely contagious, and the probability of becoming infected is high. Now imagine that scientists fail to discover a cure. 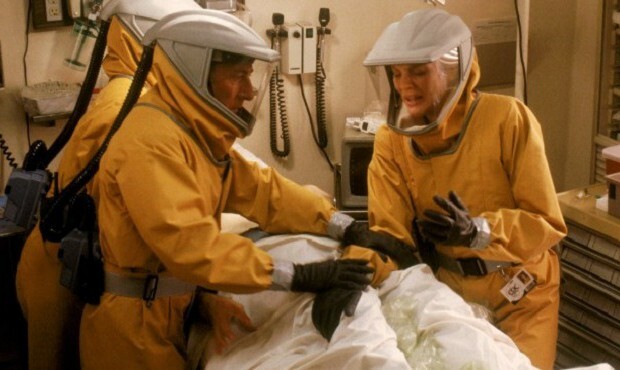 There is no Dustin Hoffman-led team of military virologists available to develop a vaccine and save humanity, and the disease persists, with the potential to infect subsequent generations. In this harsh, disease-ridden environment, how could you ensure that your future offspring would survive? It turns out, if you were a fruit fly, you might rely on recombination. But while strategies for increasing genetic variation may improve disease resistance, they often come at a cost. Increased recombination, in particular, can reduce fitness by breaking up locally adaptive combinations of alleles. One potential way to get around this issue is to increase recombination rates only when the risk of infection is high. However, we have yet to observe direct evidence of parasite-induced recombination in animals. In a study recently published in Science, Singh et al. sought to investigate the capacity of fruit flies to plastically increase recombination in response to infection. To do this, the researchers infected Drosophila melanogaster females with a variety of parasites, and observed the proportion of recombinant offspring the females produced. In order to track recombination events, researchers took advantage of the known genetic basis of two visible phenotypic traits. The ebony locus and the rough locus occupy nearby positions on the same chromosome in D. melanogaster, and recessive mutations at each of these loci have easily identifiable effects on the phenotype. For this study, the researchers generated females heterozygous at both ebony and rough. Next, the researchers infected females with one of several different types of parasites. Two distinct (but similarly disturbing-sounding) methods were used to infect flies, depending on the type of parasite involved. In some trials, the researchers stabbed adult flies in the thorax with a needle covered in disease-causing bacteria. 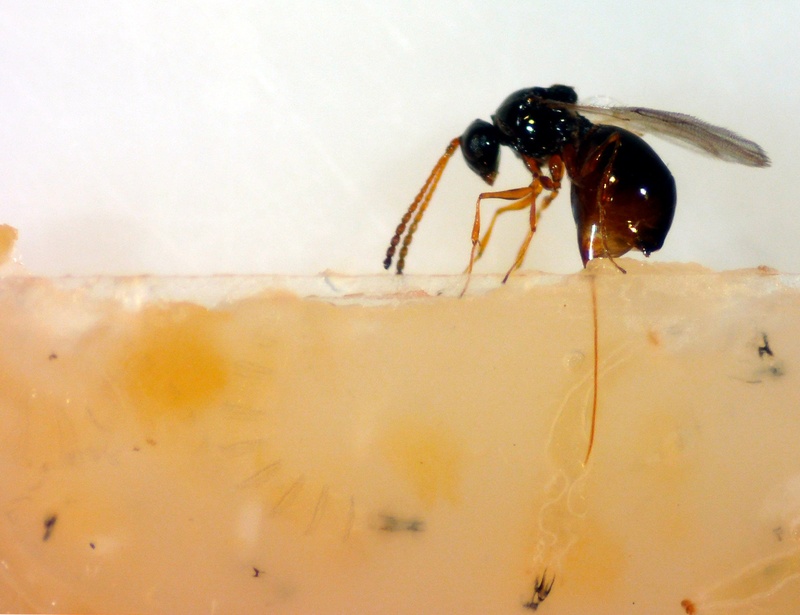 In other trials, the researchers housed larval flies with female parasitic wasps, allowing the wasps to inject their eggs directly into the larvae. Seriously, these flies must have been terrified. Finally, the researchers backcrossed infected females to double-mutant males, and examined the resulting offspring. Sorting through thousands of individual flies, researchers identified recombinant offspring as those that exhibited one mutant trait but not the other. As predicted by the Red Queen hypothesis, infected females produced significantly more recombinant offspring than non-infected females. The researchers saw this pattern across all types of infection studied, including infection by species that parasitize D. melanogaster in the wild. Furthermore, the effect persisted across host life stages, with females producing more recombinant offspring even when infection occurred during the larval stage of development. The study also provided some insight on the underlying mechanism for making more recombinant offspring, which – surprisingly – appears not to involve an actual increase in recombination rate. Instead, the culprit looks to be some form of transmission distortion, whereby recombinant gametes are promoted at the expense of non-recombinants. This study highlights the remarkable ability of individual organisms to rapidly respond to changes in the environment, as well as the central role disease has played in shaping the evolutionary trajectory of animals. But the reason I’m REALLY excited about these findings is because of their potential to reinvigorate the post-apocalyptic science fiction genre. Picture this: 50 years after the emergence of an unprecedentedly deadly cross-species pathogen, the majority of the planet’s human population has been wiped out. The only people remaining are the highly recombinant offspring of those infected with (and ultimately killed by) the disease. In a world where survival of the fittest reigns supreme, these exceptionally disease-resistant individuals must attempt to rebuild society as they contend with resource shortages, lawless bands of savages, and the unknown genetic ramifications of the extreme levels of heterozygosity within their population. It sounds like the beginnings of a pretty solid screenplay to me. While you’re waiting for my movie to hit theaters, you can read the full text of the Science article here. And check out the video below (courtesy of Dr. Michael Martin), which shows a parasitic wasp female attempting to deposit her eggs in some (probably pretty freaked out) fruit fly larvae. This entry was posted in adaptation, apocalypse, coevolution, genetics, parasitism.